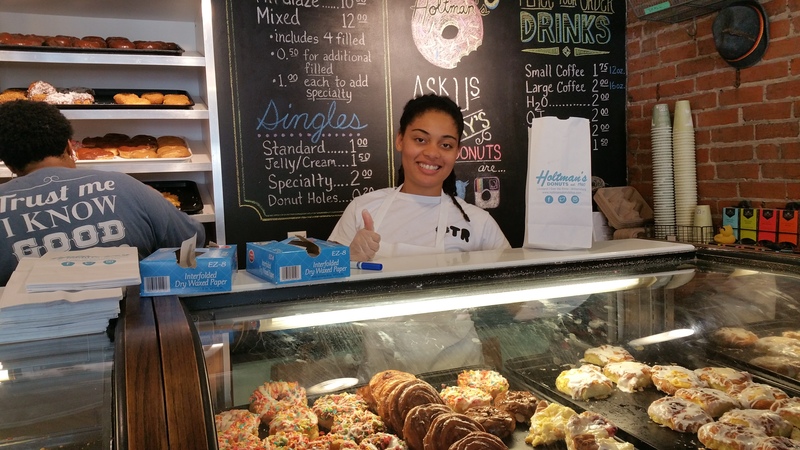 Holtman's Donuts is a favorite coffee spot in Over-the-Rhine. Orchids at Palm Court, an Art Deco gem at the Hilton Netherland Plaza. Findlay Market has more than 40 meat, produce and other vendors open year round. The Roebling Bridge connects Cincinnati with Newport, Kentucky across the Ohio River. There’s more than meets the eye in Cincinnati; from artisanal donut shops in restored brewery worker housing, to a waterfront park that would make cities twice its size proud, this is a southern Ohio town where family attractions abound in the least likely places. While many attractions are walkable from downtown, you can rent a bicycle from the public Red Bike system, or take the new Cincinnati Streetcar (a 3.6 mile loop past 15 attractions that costs $1), the red trolley, local buses or Uber to easily (and cheaply) get around. For general information, visit the Cincinnati USA Regional Tourism Network, in addition to checking out our suggestions below. Cincinnati Union Terminal, a restored art deco train terminal and national historic landmark, is currently undergoing renovation, so call ahead. Within the terminal, families will find the Cincinnati History Museum, Museum of Natural History & Science, an OMNIMAX Theater, the Duke Energy Children’s Museum and research facilities all under one stunning roof. The engaging children’s museum is designed for infants to 10-years and includes a “Kids’ Town,” an adventure-based wilderness setting called “The Woods,” the “Little Sprout’s Farm” and a fun “Inside the Grin” dental adventure. The Newport Aquarium houses thousands of aquatic creatures in specifically themed galleries that cover a world of marine life. Study a variety of sharks, stingrays, and exotic fish as you walk — looking up, over, around and through — a clear winding tunnel. Ask questions of naturalists in scuba gear, who answer through air masks during feeding time at the large theater. It’s compact and easy to tour, there are touch tanks for little ones, and seahorses and penguins are especially riveting. Take the $1 Southbank Shuttle Trolley, or stroll across the Roebling Bridge (a small version of the Brooklyn Bridge done by the same engineer) to get there, and explore. Your starting point is Newport on the Levee, a lifestyle shopping mall with restaurants and ice cream parlors. We understand how the city’s funky Over-the-Rhine district might remind visitors of Williamsburg, Brooklyn, but this vintage waterpark recalls Brooklyn’s classic amusement park only in name and hot dogs (and the hot dogs are doused with chili in the Cincinnati style). A huge outdoor pool with diligent lifeguards, a carousel, sunbathing lawns, yummy junk food, live concerts, funky locker rooms: all the elements here for a great day out are amplified by the wild new Typhoon Tower. Climb into a cranny of this huge splash and squirt zone, hide under the swooping waterslides or behind the spray stations, and you’ll be able to keep your eyes open when the 1,300-gallon tsunami of water crashes down from the Hydro Tower. Epic soak. Visitors will enjoy taking an Uber up to Eden Park, one of those hidden gems tucked into the verdant hills above the city. There’s plenty of hiking to be had, but perusing this ca. 1933 conservatory may swallow up your day. Designed to mimic several different extreme climates for the purpose of growing and observing rare and beautiful plant life, there are over 3,500 species from throughout the world. Visitors can inhale the fragrances, learn about rain forest, desert garden, tropical jungle, or orchid environments, and do craft projects. The most exciting event is the annual butterfly show, when children get to interact with hundreds of butterflies in a netted room filled with nectar feeding stations. Since 1886, this museum tucked into Eden Park has welcomed visitors to an art collection covering 6,000 years of history, and at no charge. Visit this museum with a huge Pinocchio outside and you’ll find interesting temporary exhibits in addition to its varied collection. Check out their schedule for free concerts and guided tours, including children’s activities, teen events and family programs. The onsite Rosenthal Education Center has weekly toddler and preschool art appreciation workshops. This refreshed theme and water park is a property of Cedar Fair, and the largest of its kind in the Midwest. There are specially-themed areas for younger children (including Planet Snoopy) and a variety of thrilling rides. Visit with 60 life-sized dinosaurs in a seven-acre Jurassic themed zone. Catch Diamondback, hurtling down a mile-long track at 80 mph. The Beast is a looping wooden roller coaster with 7,400 feet of twisted wooden track, traveling at 65 mph. Cool off at the Soak City waterpark, challenge yourselves on the seven-story Tropical Plunge slides, and enjoy a live stage production to round out your day. Opened in July 2016, the Ark Encounter is a 510-foot-long reproduction of Noah’s Ark, including exhibits about the many animals said to have sailed aboard it during the Biblical 40 days’ flood. The largest timber structure in the world, it is only Phase 1 of this project, and has many religious and educational displays, a small petting zoo and live shows for visitors. Note that this unusual museum is located about 40 miles south of Cincinnati and not far from its sister, The Creation Museum. Overlooking the Ohio River that divided the Confederate state of Kentucky from the abolitionist Ohio, this compelling museum tells the story of slaves who gained freedom through the secret Underground Railroad, as well as contemporary issues in human trafficking. The tough slavery material is covered in dense displays, and “Escape!” has some interactive and role-play elements. Experience the agony of slavery inside “Slave Pen,” an authentic 19th century wood prison recovered from Kentucky that was once held more than 75 slaves. Most effective for kids ages 10+: the 25-minute film, “Brothers of the Borderland,” chronicles a scary cross-river escape. Other educational displays include “Invisible: Slavery Today” about the $28 billion human trafficking business, and “The Struggle Continues” about global issues. Cincinnati plans smart; this terrific urban park located on 45-acres of downtown Ohio riverfront is elevated to preclude flooding while delivering fun and/or relaxation day and night. The Schmidlapp Stage and lawn are packed on event days and hanging rattan basket chairs are occupied early morning. If you’ve rented a public Cincy Red Bike, roll along the riverfront to see the rock slide, carousel, interactive fountain that kids can play in, shady groves of trees, giant piano to play with your feet, a flying pig ride, historical markers and commemorative statues. 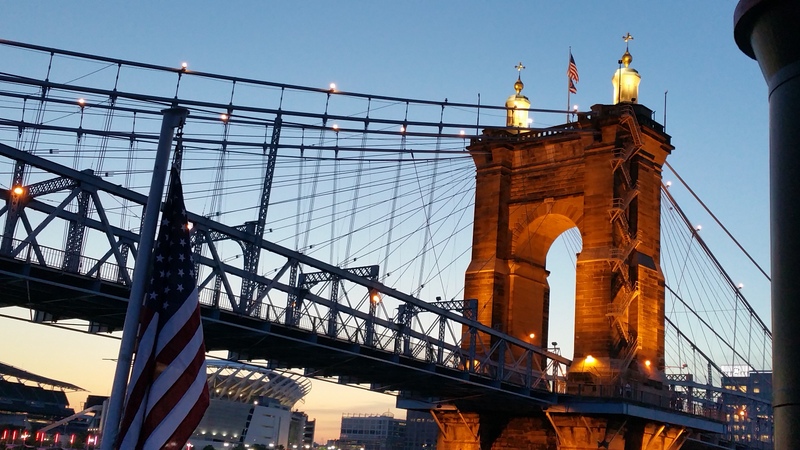 The city’s long history of local breweries is honored at The Moerlein Lager House, whose hot dog wurst menu and deck overlooking the Roebling Bridge make it popular with families. Want a dose of glorious 1920’s Art Deco architecture — a Cincy “must” — plus a good view of the city’s skyline from downtown? An Observation Deck is on the top (49th) floor of Cincinnati’s second tallest building, which also houses the beautifully restored Hilton Cincinnati Netherland Plaza Hotel. At almost 600 feet tall, the tower’s observatory provides great views of parts of Ohio, Indiana and Kentucky, all for $4 per adult and $2 for ages 6-11. 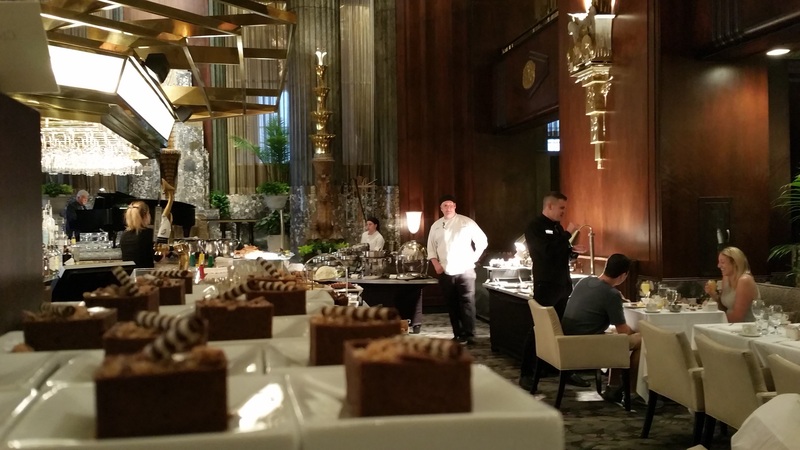 Afterward, treat everyone to a decolicious Sunday brunch feast or a snack at the Orchids at Palm Court restaurant. It was named Over-the-Rhine or OTR because German immigrants used to go uphill from riverfront factories to their tenements on the other side of Central Park canal (now filled in). That catchy nickname plus streets packed with ornate and plain brick tenements have proven a rich draw for young entrepreneurs, chefs, designers and craftspeople. OTR, transformed in the past decade from crime and abandonment to hipster and teen haven, symbolizes the many changes the city has undergone. The centrally located Washington Park boasts new playgrounds, a dog park, free exercise and dance classes, and great views of the Cincinnati Music Hall, undergoing restoration. 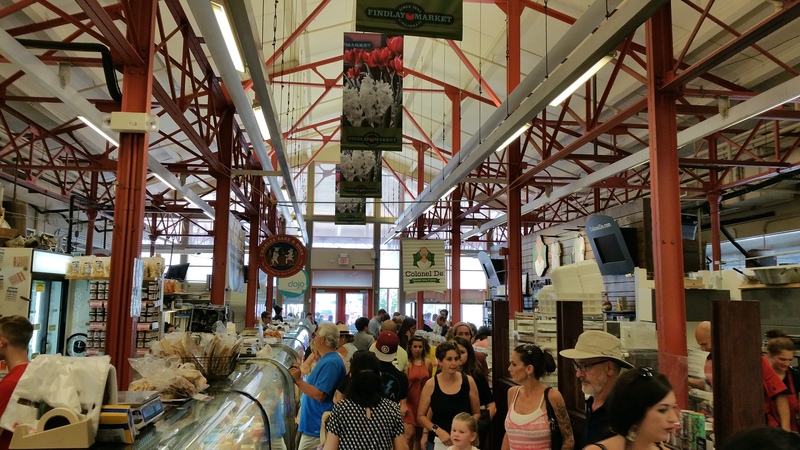 Findlay Market, the city’s oldest continuously operated market with more than 40 vendors indoors year-round (and dozens more outside in good weather), is a treasure for foodies. Stop by for an artisanal sampling at Maverick Chocolate, taste some sausage at one of the butchers, buy tomatoes at the farmers market stalls, take selfies with a street mime, have a maple bacon donut at Holtman’s, or a bowl of pho at Pho Lang Fhang. If you’re a foodie chef, ask about Findlay Kitchen, a kitchen-sharing option that gives budding restauranteurs a professional, licensed kitchen to test their goods. A must. Take a break aboard an old-fashioned paddlewheel riverboat cruising the Ohio River for sightseeing, wine tasting or live music. The Captain’s Cruise (Tuesday- Saturday only) provides a two-hour break complete with games, entertainment and buffet, which includes dessert. If a sightseeing tour is what your family is after, book this without a meal option. Other seasonally themed cruises are available, some with commentary as you explore this historic city. Events bolstering the well deserved civic pride (and honoring sports teams) include free concerts, street parties and much more. The city’s waterfront Great American Ball Park is aglow in fireworks after every Friday home game of the Cincinnati Reds, for examples, at a stadium with a big Fan Zone where kids can play, a bar that serves 65 craft and local brews, and a Pampers Nursing Station where moms can breastfeed in comfort and privacy, while watching the game from a big screen TV. Check out the thousands of public events listed on the city calendar before arrival, and plan on attending at least one local festival or performance to people watch. Favorites include the Glier’s Goettafest each August, when the local sausage is honored in Newport on the Levee. Thanks to Ron Bozman for his reporting.